Les Annales. Histoire, Sciences Sociales, une référence internationale depuis 1929 Founded in 1929 by Marc Bloch and Lucien Febvre, the Annales has always sought to transcend its prestigious heritage by continually presenting the most innovative research in the field of history. The journal provides a unique platform for dialogue between the various social sciences, remaining open to new fields of research, comparative history, cultural analysis, and epistemological reflection. Renowned experts and emerging historians alike contribute to keeping the spirit of the Annales alive. The journal also accords an important place to the examination of recent scientific developments in the form of book reviews (200 per year) and in-depth analysis of the most important works being published today. 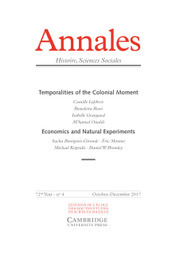 The Annales is the most widely distributed Francophone journal in the world. The Economic History of Africa: Renaissance or False Dawn? What Do We Really Know about Athenian Society?